Pumpkin biscotti is a type of cookie that is twice baked so its texture is extra hard. 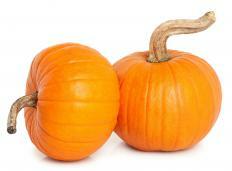 The recipe includes a variety of ingredients with the star being pumpkin puree. Adhering to a few tips can help the biscotti taste and look its best. Though pumpkin is the base flavor, there are several additions that can be made for those who want variety. Although it can be served year-round and eaten by itself without any beverage, it's typically enjoyed during fall months with a hot beverage. Biscotti in Italian translates to “cookies,” but the word means twice baked. It starts out being baked as one large piece, also known as a loaf, then after the loaf is sliced, it's baked again to give the individual pieces their extra-hard texture. Any icing drizzle is added after they are baked the second time but before they cool. Although it has to bake twice, pumpkin biscotti takes less than two hours to make. Some ingredients can vary, but the ones that give it a specific pumpkin taste include pumpkin puree, sugar, cinnamon, nutmeg and ginger. Other ingredients include flour, baking powder, salt, vanilla extract and eggs. Pecans are optional as is chocolate or vanilla icing to drizzle on top afterward. Each recipe makes approximately 24 cookies. One of the best tips for making pumpkin biscotti is to not try to cut the time by baking them only once, either by baking them as individual pieces or as an entire loaf. Another tip is to cook them on a wire rack so as to not need to flip them over during baking. Also, don't try to cut the cookies while the loaf is still hot. There are quite a few varieties of pumpkin biscotti for those who love the base flavor but want to try something a bit different; in some cases, changing the flavor requires adding only a couple of ingredients. For white or milk chocolate variations, add white or milk chocolate chips to the recipe, then melt a little extra and drizzle it on after the pieces are baked the second time. To allow the chocolate to set, put it in the freezer for a minute or two or in the refrigerator for a few minutes. To make a cranberry variety, add dried cranberries to the recipe. Considering fall is pumpkin season, some prefer only to make pumpkin biscotti during the autumn months in order to use fresh pumpkin puree. The treat is delicious enough to eat on its own; however, due to its hard texture, some prefer to dip it into a hot beverage. Some of the best options are hot cocoa with whipped cream and a little cinnamon on top, or with any flavor of coffee. How Do I Choose the Best Pumpkin Dipping Sauce? What Are the Best Tips for Baking Biscotti? What Are Pumpkin Cheesecake Bars? What Are the Different Types of Low-Fat Sweets?